Place, politics and people: what do we mean by ‘segregation’ in London? At City Lab, a US site concerned with cities of the future, Richard Florida asked political scientist Ryan Enos about how urban geography relates to political conflicts. Enos set out his view that the separation of different groups of people into different areas adds to a “psychological space” between them, which makes it harder to cooperate and compromise, and damaging political conflict more likely. This got me thinking about a characteristic of London often seen as a cause for pride and how that perception seems to have shifted since the Grenfell Tower fire. Ever since I have been writing about London it has been praised – and has praised itself – as a place where the well off, the poorly off and all those in between live in close proximity. A warning contrast has often been made between London’s “mixed communities” and those of Paris, where many of the poor and “other” are concentrated on the outskirts, in marginalised, riot-torn banlieues. There is plenty to be said about media constructions of London that have flowed from coverage of Grenfell, not least the narrative that has tied the tragedy directly to alleged Tory negligence, Town Hall parsimony and “the cuts”. In time, we shall learn if Sir Martin Moore-Bick’s inquiry finds the story quite so straightforward. But one consistent theme has been the re-depiction of London’s social composition as a moral indictment rather than as a reason for pride. I’ve lost track of the number of articles and broadcasts drawing shaming attention to the contrast between the fabulous affluence of some people and properties in the the Royal Borough of Kensington and Chelsea and the very adjacent presence of council estates, mostly comprising social housing, whose residents in many cases are on low incomes. Rather than this being portrayed as an example of how even the very poorest Londoners have not been banished, Paris-style, to London’s fringes, it is cited as shocking evidence of the most glaring inequality – a chasm that helps explain where blame for the fire lies. The nearness of the homes of “the poor” to those of “the rich” has been interpreted in a completely different way from previous, more upbeat accounts. What might have been perceived as beneficial, egalitarian “mix” has been re-cast as malign segregation. Much journalism, of course, including the “quality” variety, thrives on the promotion of outrage, the feeding of conflict and the reduction of complex issues to crude polarities. But what is the right and realistic way to assess the variegations of London’s many neighbourhoods and what are the implications for the city’s spatial and social evolution? Where Grenfell and its surrounding territory is concerned, there is no question that the contrasts between the cluster of council-owned estates of which the tower remains a part and some of the nearby private residential streets is stark. On my first visit to the area a few weeks after the fire – how many more hacks did residents need descending on their doorsteps in the first few days? – the symbolism of emerging from a tableau of elegant al fresco dining on Blenheim Crescent and looking up to see the tower in all its charred cruelty a short walk ahead was powerful. That said, it might also have deceived. Not everyone who lived in Grenfell Tower was poor and not everyone who resides within the handsome streetscapes of North Kensington is loaded. And if we take the view that, even so, the close quarters contrast between spectacular wealth and its opposite is undesirable, what might we suggest for lessening it? One arguable option for any borough where such disparities are troubling would be to redevelop some of its housing stock in such a way that existing social renting residents are re-housed on the same site if they so wish and additional dwellings built there too, some of them affordable for middle income households and some for high end market sale, the proceeds of which would help to pay for the social and other affordable homes. Wouldn’t that simultaneously create a more “mixed community” and also provide a bridge across the gap between housing wealth extremes? In fact, Kensington and Chelsea’s now former cabinet member for housing and regeneration, Rock Feilding-Mellen, had such an approach in mind before Grenfell led to his departure. The policy was fiercely opposed, as similar ones have been elsewhere. Perhaps it was wrong, badly implemented or both. Yet the resistance to it, however justified, raises the question of how else land and housing policy can break down separation, if that is the sort of London we desire. My point is not that huge inequalities in London are OK. Nor is that “mix” should be remorselessly engineered by demolition and redevelopment. Both issues are highly problematic. Rather, it is that both the view of London as a patchwork of inclusive, socially integrated neighbourhoods and that which, post-Grenfell, tells a “tale of two cities” in which pampered super rich and misused poor exist separately side-by-side over simplify and can mislead. And what are the benefits of tighter mix for poorer people? Well, more prosperity in an area can help to produce better schools, more employment and pressure for better public amenities. But does someone in poor health and on low pay become fitter and richer just because someone middle-class moves in next door? The evidence about such helpful “neighbourhood effects” is, well, mixed. I take Ryan Enos’s point about geographical separations deepening social separation and making the successful interaction between differing groups of citizens harder to achieve. And I would hate to see the profoundly mixed character of the sort of London neighbourhood where I live disappear and a Parisian configuration emerge in its place. For that reason, I applaud boroughs seeking to provide the largest amount of affordable housing they can of the widest possible range with the fewest possible adverse effects. At the same time, managing the geography of housing in an equitable way is only one part of the challenge of building the Good City. The baleful “social cleansing” chorus and recurring “segregation” frenzies about issues such as “poor doors” – which are actually an aspect of pragmatic means of increasing affordabililty and maintaining neighbourhood mix, not its antithesis – deny the difficulties of this. They are also a distraction from addressing the problem of which housing costs and locations are a symptom as well as a cause, which is that too many Londoners are struggling to get by. They need more affordable housing and they need better pay. Those should be London’s priorities when it comes to stopping the harmful “psychological space” Enos describes from growing. 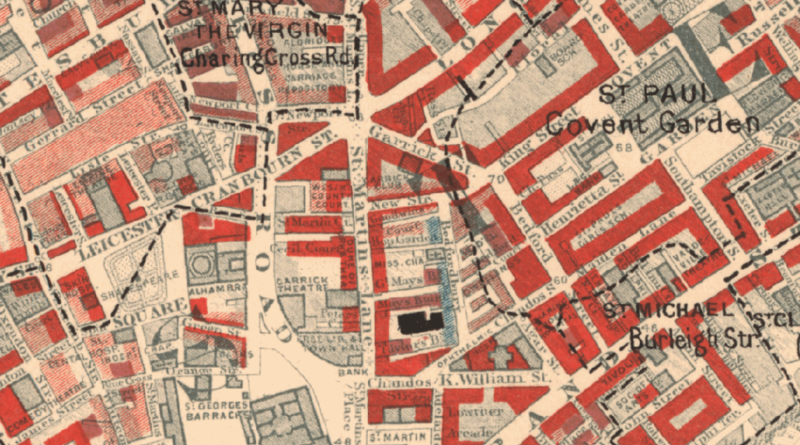 Illustration from Charles Booth’s poverty map of London. THANK YOU for reading this article. OnLondon.co.uk has launched a five-week, all-or-nothing crowdfunding project and needs your donations to keep it going and growing. Read more about that and make your pledge via this link. Thank you again.